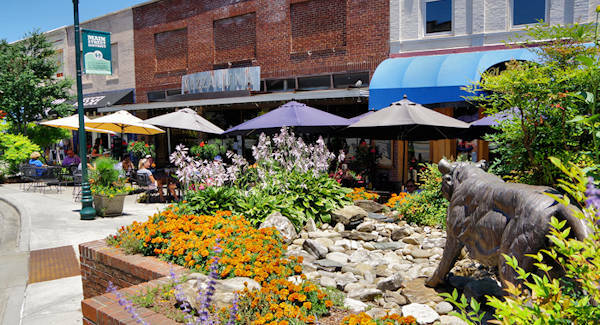 Downtown Hendersonville has the second largest downtown in western North Carolina (Asheville is the biggest) with many things to do, see and taste. Beautiful Main Street serpentines around planter boxes and lush landscaping. With more than 100 shops and 25 restaurants, it is a delight to explore the big variety of locally-owned, high-quality stores and galleries. And see their famous painted bears! Hendersonville's downtown is part of the Main Street Program, the National Trust for Historic Preservation's program to revitalize the nation's central business districts through historic preservation, attention to design, thoughtful recruitment of businesses and promotion. And it shows! Since most businesses are along a six block section of Main Street and its intersecting streets, it's easy to explore. 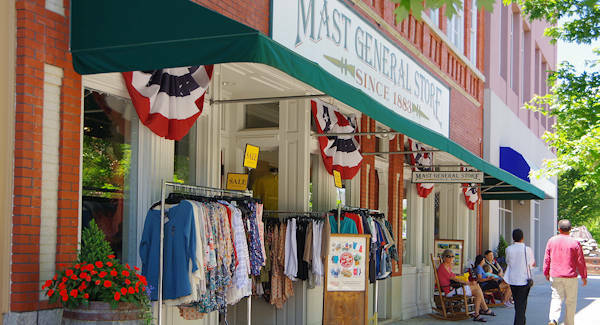 Mast General Store (527 North Main) is always a favorite stop. On the other end, stop at the Visitor Center (201 South Main) for plenty of information about things to do. Don't stress out trying to get one of the free parking spots on Main Street since there's much more parking on the parallel streets one block away. 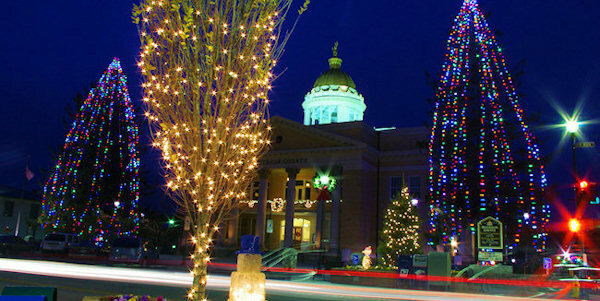 The Christmas season brings many lights and events in November and December. Read about Home for the Holidays. 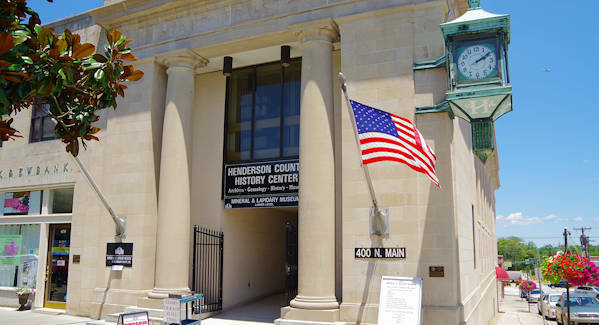 Inside the Courthouse is the interesting Henderson County Heritage Museum (1 Historic Courthouse Square), open Wednesday-Sunday. Admission is free, so it's definitely a must-stop. Be sure to break for some sweets at the old-fashioned McFarlan Bakery, a fixture there since 1930. The Curb Farmer's Market has been going strong since 1924, with its selection of baked goods, handmade crafts, jams, etc. on Tuesdays, Thursdays and Saturdays. Another great stop is the Mineral & Lapidary Museum (400 North Main). See exhibits from North Carolina, replicas of world-famous diamonds, English minerals, Indian artifacts, a dinosaur egg nest, fossils, fluorescent minerals, gems and faceted minerals. The museum's specialty is Geodes, which are sold, cracked and/or displayed. Admission is free and it's open Monday-Saturday. Hands On Children's Museum (318 North Main) offers an affordable, educational and fun way to spend the day with your children, grandchildren and students ages 1-10. New for 2019! The Center for Art & Inspiration (125 S. Main Street) is a busy destination for theatre and the arts, plus a bookstore and coffee shop. Their professional theatre includes Murder Mystery Dinner Theatre under the direction of Broadway veteran Jimmy Ferraro. Just outside of downtown Hendersonville is a famous angel. Author Thomas Wolfe’s first novel was Look Homeward, Angel. In the book, there are constant references to an angel statue carved from Italian marble. This is the angel Wolfe placed in American literature. Thomas Wolfe’s father, W.O. Wolfe, sold the statue to the Johnson family to mark the family plot in Oakdale Cemetery. The angel is holding a lily in her left hand and extending her right hand upward. Oakdale Cemetery is located on US Highway 64 West, just a short distance from downtown. Downtown breweries include Southern Appalachian Brewery (822 Locust) specializing in making small batches of craft beer, including their German Pilsen, Belgian Blonde Ale and Copperhead Amber Ale. Sanctuary Brewing Company (147 First Avenue East) is a place for craft beer enthusiasts and animal lovers for a strong sense of community - with farmhouse ales, American stouts and West Coast IPAs. The Brandy Bar (504 7th Ave East) features 43 brandies from across the world and is believed to be the only bar in North Carolina to focus exclusively on brandy. Located in the Historic Seventh Avenue District, they are open Wednesday-Saturday 4-12 PM. This is apple country! In late summer and fall (August through early November), visit many orchards and take home a big variety of apples, pumpkins and more! 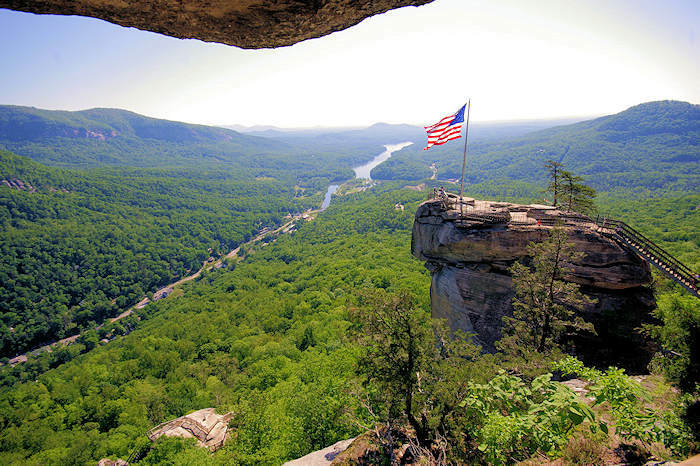 Many are located along US Highway 64 East toward Chimney Rock. See our Apple Orchard Guide. 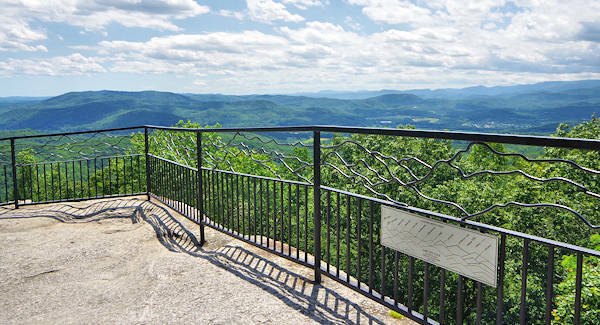 Jump Off Rock: This drive-to scenic overlook provides a panoramic view of rolling pastures, the Blue Ridge and Pisgah mountain ranges. Jump Off Rock is located just 5 miles from downtown (4433 Laurel Park Hwy, Laurel Park, NC). The park is open daily, sunrise to sunset. No admission charge. Read more. At Historic Johnson Farm, tour the farmhouse and building from the early 1900s, located a few miles outside of Hendersonville. Read more. Garden Jubilee Festival: Spectacular two-day festival, held on Saturday and Sunday of Memorial Day weekend. The ideal festival for passionate gardeners searching for the perfect plants, unique lawn and garden accessories, and arts and crafts with 200 vendors. Speak with the experts at clinics and gather tips. Read more. 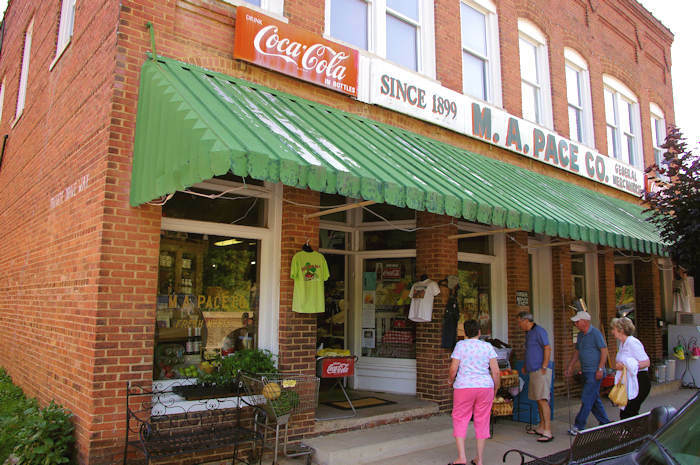 Apple Festival: A four-day celebration on Labor Day Weekend in honor of the North Carolina Apple, featuring a street fair on Main Street with continuous live music and entertainment, arts & crafts, apple products, children activities, special exhibits, food and King Apple Parade. See our Apple Festival Guide. Music on Main Street: Free live music Friday nights, 7-9 PM, mid-June through mid-August, at Visitor Center (201 South Main St). Bring your own chair! Classic car show too. July 4th: Parade at 11 AM, ice cream social at Noon. Free live music 7-9 PM followed by fireworks at dark. Rhythm & Brews: Music and beer on the third Thursdays in May-September with local breweries. Fiesta Hendersonville: Held on September 22, 2019 on Main Street. Experience the best of 20 Latin American countries with their people, music, art, food and culture. Free admission. Read more. Art on Main: Meet 85+ juried artists sell fine art paintings, in ​addition to works in clay, metal, wood, fiber, photography, jewelry, etc. Last weekend in September, Saturday & Sunday 10-5. Home for the Holidays: Many events from Thanksgiving through New Year's including ice skating, many lights and carriage rides. Read more. See a fabulous professional show at the State Theatre of North Carolina, about 30 miles south of Asheville, with an eight-month season of plays including Broadway musicals, comedy and drama. This fascinating National Park Service site honors the accomplishments of Carl Sandburg and wife Lilian. Tour their home with all original furnishings, visit the goat farm and hike trails at Connemara. Many programs. Located in Flat Rock, just south of Hendersonville. See award-winning restored, antique replica and vintage airplanes at the Hendersonville Airport. Take a close-up look to airplanes and talk to people who love them. (.5-3.5 miles, easy to strenuous) Hike a variety of trails and learn about the forest in this largely unknown gem near busy DuPont State Forest. Open mid March-mid November, find a tranquil and diverse forest along with picnic tables and exhibits. 10 miles from downtown Hendersonville. 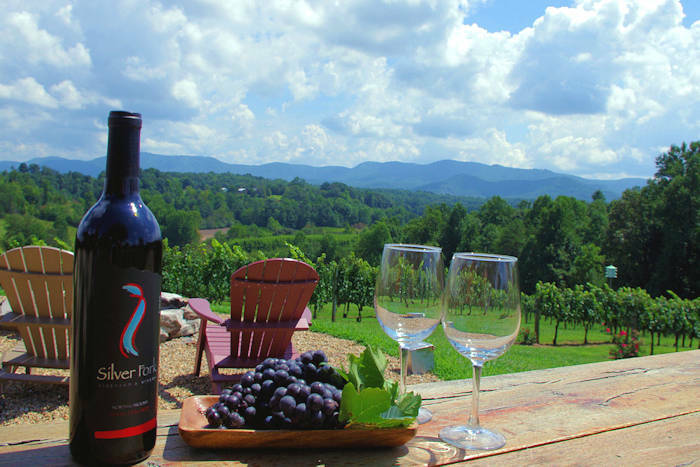 Visit three award-winning wineries on a 10-mile scenic drive just east of Hendersonville in apple country. Each has both indoor and outdoor spaces with beautiful views, live music and more. Head to Hendersonville for a self-guided tour of cideries that create a big variety of hard ciders from local apples and blackberries - about 20 minutes south of Asheville. Near several wineries too! Get your fresh mountain apples at an orchard in the largest apple-producing area in the east. Many orchards are open daily, several offer tours, events and pick-your-own apples. It's a quick drive from Asheville, with many orchards located along US 64 East of Hendersonville.